It’s time to enjoy the dog days of summer. Yes, a period of laziness, which for the first few weeks is pure delight, but it’s reached the time when those brains need to be working a bit again. Over the last month, I’ve been scanning the web for some free on-line reading games for kids, to be used both on our computer and ipad. Get playing, Get Thinking, Get Reading is their tag line, and I am ready for that this summer. GoGo Kabongo develops cognitive skills that are essential to reading. They have built in games to develop thinking skills, and adapts to your child’s level with a built in reward system. So give it a try and instead of having the kids turn on the TV in this hot heat, let them play some fun, reading games. 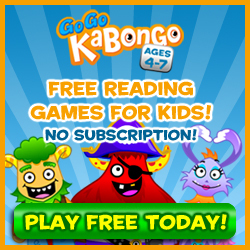 Use this link to sign up for these Free On-Line Reading Games for Kids.